3. Is Whitening Toothpaste Bad for Your Teeth? 5. What Is The Best Choice? As the media are popularizing the image of sparkling teeth, products to whiten teeth have attracted the attention of many people. It is estimated that American people spend over $1.4 billion on these products every year . Among the most popular methods is whitening toothpaste. But do they really work? More importantly, is whitening toothpaste bad for your teeth? This article will help you figure out the secrets behind whitening toothpaste. Universally, our teeth will become discolored over time. 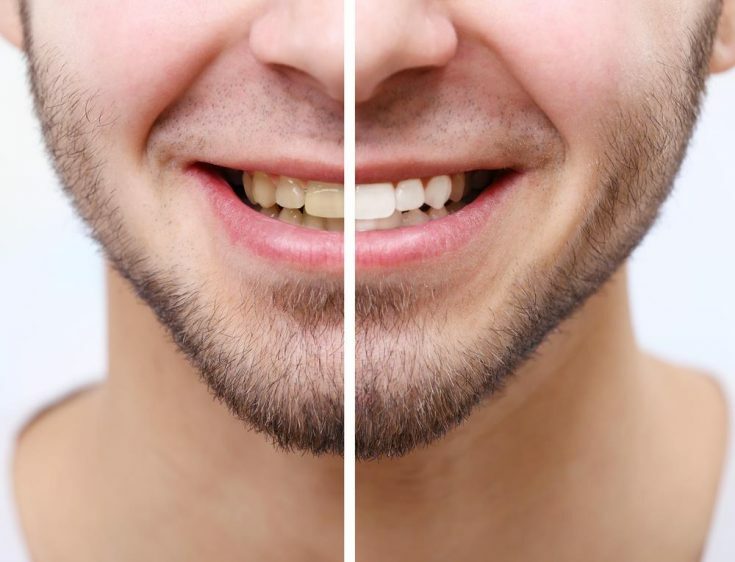 Aging process has direct influence on our teeth which will soon become brownish yellow. Besides, there are some factors that will speed up this process, even when you are not old already. Smoking or the excessive consumption of wine or coffee is mainly responsible for brown stains on your teeth . But humans are always fascinated by white, sparkling teeth that make them shining in every smile. Thus, the manufacturers have taken advantage of this and made profit from whitening products, including whitening toothpaste. Normally, whitening toothpaste is effective for eliminating surface stains on your tooth. It is suitable for those who have the problem due to consuming coffee or smoking. This translates that whitening toothpaste is not so effective for deeper stains. On the other hand, it does not really improve your teeth’s natural color. The difference between whitening toothpaste and other products, such as gel, bleaching or strips, is the lack of peroxide in its content. For its effects, whitening toothpaste only relies on some special abrasives and chemicals which contribute to dissolving stains . In addition to chemicals and abrasive agents, whitening toothpaste also contains some enzymes which actually only prevent darkening. They do not play any essential role in lightening your teeth. However, when hearing about these ingredients, you may be seriously concerned “is whitening toothpaste bad for your teeth”? Are these chemicals harmful for your oral health. Well, let’s find out how true these statements are. The birth of whitening toothpaste is a response to our increasing demand of white teeth, despite unhealthy lifestyles and aging process. In other words, it fights against a natural mechanism in our body. To make it come true, the manufacturers have used some chemicals that of course pose potential threats to our health. And our enamel tends to suffer most. However, most whitening products can minimize the negative effects. You are in danger only when you use it excessively or fall into wrong options. According to a study, abrasive toothpaste is claimed to have better cleaning effects. But it is also a potential risk for your teeth . Some abrasive toothpaste is likely to make your tooth enamel thinner over time. As a consequence, the dentine which lies beneath the surface of your teeth becomes more exposed and damaged. For those who have little idea of the dentine, it is related to your tooth’s nerve. When it becomes damaged, you are more likely to suffer from cold or hot sensation and pain in your teeth. If you are wiser about choosing whiten toothpaste, you will know that sensitive toothpaste is useful to plug little pores in your teeth. Meanwhile, abrasive toothpaste will open them up and make you suffer from different irritating sensation. So, enamel is in danger. But can whitening toothpaste be bad for other body parts, in addition to your teeth? According to the Environmental Working Group’s Skin Deep Cosmetics Database, experts examined a series of whitening toothpastes. They are 35-page long. Among them, just 10 percent was considered as low-risk group. Surprising, abrasion is not among top risks that are worth our concern. Fluoride is commonly present in whitening toothpaste. And it is listed as one of the potential ingredients for different men’s and women’s health . It is closely related to organ damages inside our body, including lungs, eyes and skin . So, is whitening toothpaste bad for your teeth? Yes, side effects are possible to happen, but only when you overuse the toothpaste or go for too abrasive options. It is important to bear in mind that toothpaste only stays on our teeth for a short period of time. Then, we will wash it away with water. So, the period might not be long enough so that the effects happen immediately. “Is whitening toothpaste bad for your teeth” is still a controversial issue in the medical community. Meanwhile, we know for sure that these products are more expensive than regular ones. Thus, it is a good idea to learn how to use them wisely, instead of wasting a big sum of money without any significant improvement. Worse, your teeth might be even in danger. As mentioned above, most side effects come from too abrasive toothpaste. So, why don’t we go for more natural toothpastes, such as Sensodyne Pronamel or Tom’s of Maine Simple White. Check WHAT IS THE BEST WHITENING TOOTHPASTE FOR ALL TEETH TYPES to know which one is good for you! They have been carefully selected with the ultimate goal to protect your enamel. They help whiten our teeth in a more natural way and more importantly, you will not find bleaching chemicals in their content. If you wish for more powerful effects, you can mix a bit baking soda into the toothpaste. It is a popular home remedy for removing brown stains. You can find out more at HOW TO GET RID OF BROWN STAINS ON TEETH! 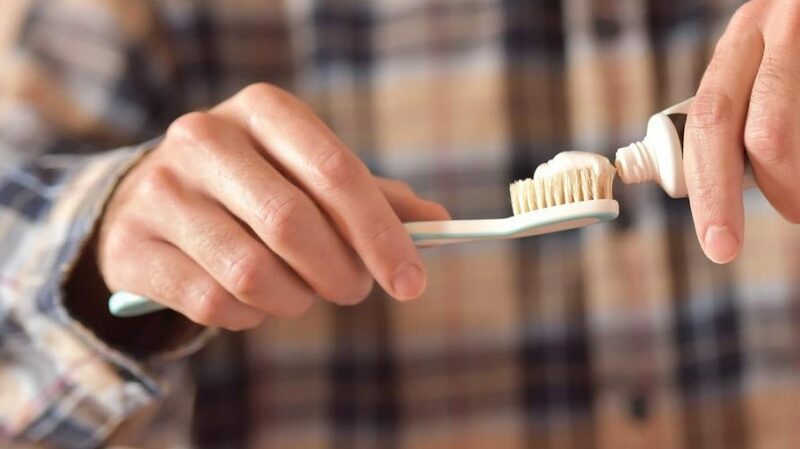 To lower the risk from abrasive toothpaste to the fullest extent, you had better think about choosing a soft toothbrush as well gentle whitening toothpaste. Using too much force in brushing your teeth does not make significant different, so protect your teeth first. In addition, do not overuse whitening toothpaste every day. The best frequency to use it is around 2-3 times on a weekly basis. Overall, there is nothing more certain than visiting your dentist regularly, instead of making decisions on your own. A professional will give you proper advice just in time to help you not only protect your teeth but also improve your beauty. If you insist on the use of whitening toothpaste to make yourself much more confident, here are some examples which guarantee a safe result. It is not necessarily some kinds of sensitive whitening toothpaste, but they are not bad for your teeth at all. In fact, their effectiveness has been proved by many people around the world. Undeniably, Colgate is a reliable brand in the industry of whitening toothpaste and experts always recommend using products from trustworthy brands to avoid bad consequences for your teeth . 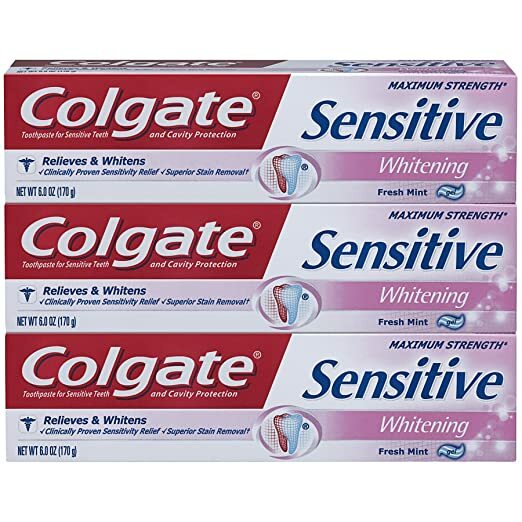 This whitening toothpaste from Colgate is labeled as “Sensitive”, which means that it holds FDA-allowed active ingredients to fight against sensitivity. It also contains potassium nitrate that penetrates deeply into your teeth. In other words, it whitens your teeth naturally and safely by eliminating surface stains on the teeth. Furthermore, this product proves to be useful for preventing cavities and other oral problems. It provides the 24/7 protection and you had better use it regularly. Enamel is the most vulnerable part when it comes to the use of whitening toothpaste. 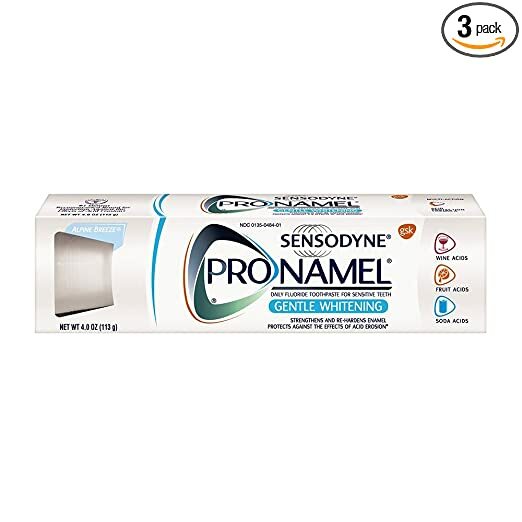 Yet, if you are familiar with Sensodyne’s Pronamel products, it is no longer an issue. Pronamel has been long appreciated as the best brand for protecting our enamel. In fact, it is even able to enhance the strength of enamel. This product comes as an agent to prevent acid erosion. When you continue to use it every day, you can count on it to improve acid-weakened enamel and reduce the risk of cavities. It has great influence on your breath as well. It is an ideal choice for those who are afraid of bad effects of acidic drinks and foods. Your enamel will get a great layer of protection to stay away from further damage. If you are concerned about abrasively, this whitening toothpaste is very low-abrasive. Therefore, enamel is less likely to experience erosion. 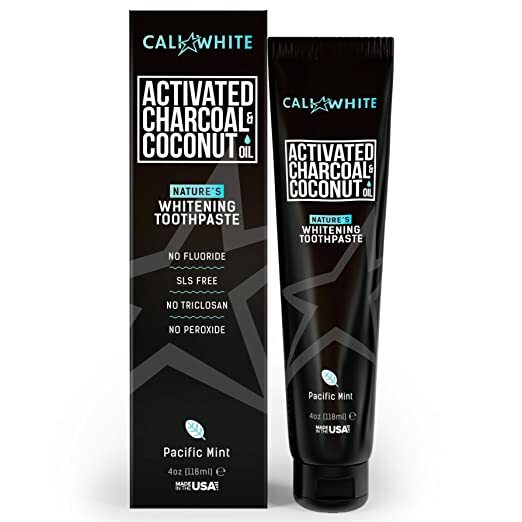 This whitening toothpaste is special because of an active ingredient – activated charcoal. If you are still uncertain about its role, check HOW TO USE ACTIVATED CHARCOAL FOR FACE immediately! Activated charcoal is such a great addition to whitening toothpaste with amazing qualities to fulfill its mission. Not only are you free of nasty abrasive and chemical agents, but you are also exposed to organic ingredients, including coconut oil or baking soda. They are all beneficial for making your teeth healthy and sparkling. Besides, this toothpaste provides you with an opportunity to improve your breath. You will feel fresh immediately after using it. It also has amazing antiseptic nature to prevent the concentration of bacteria in your mouth. So with all these products, you do not have to worry about “is whitening toothpaste bad for your teeth” any more. Is whitening toothpaste bad for your teeth? Yes, it does if you are ignorant of choosing the appropriate toothpaste. Or you abuse it in hope of getting white teeth overnight. It is necessary to bear in mind that whitening teeth takes time, often a lot of time. So, you cannot rush with some products that potentially damage your enamel. Be wise in choosing and using whitening toothpaste to get the best outcome. Do not forget to LIKE and SHARE our article so that more and more people are aware of this issue!